Our books help support our mission and ministry. 100% of profits are used directly to help those in need. Please note: The book and the workbook are both mandatory for workshop participation! Books available on-site. In The Christian Codependence Recovery Workbook we confronted the distorted patterns of codependence, and faced the lies that held us back from seeing God, ourselves and others accurately. In this next book, we will move beyond the lifestyle of codependence and self-sufficiency to embrace God’s plan for love, intimacy and wholeness. Allowing the process of true change and growth to be developed in and through us in our mind, emotions and decision-making capabilities. 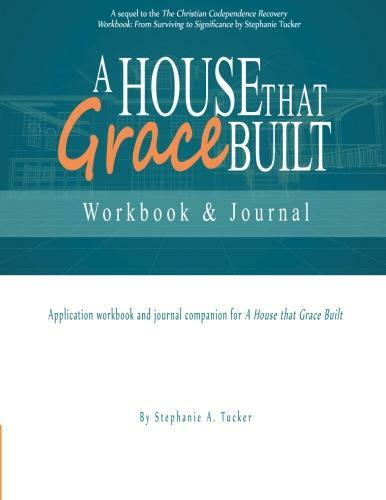 This is a companion workbook for a House that Grace Built (it needs to be purchased with A House that Grace Built)! A House that Grace Built leads us beyond codependence to discover a life empowered and led by our Creator. By learning to understand His design for life and relationships, we can leave our survival skills and walk into our callings and destinies as children of God. But as we quickly find, learning something in our head is much different from understanding it in our heart. This companion workbook takes us chapter by chapter through the concepts and lessons taught in A House that Grace Built, asking questions that provoke us to search, assess and understand at deeper levels the principles it contains. Through the use of various charts, worksheets and other helpful tools, we have the opportunity to not only put behind our dysfuntional relationship patterns, but to embrace and live our lives God’s way. This workbook provides a guide to securing God’s perspective and gaining His tools to cope with addiction’s viscous entanglement. It will reveal and disclose how and why the addict comes under the destructive force, and in turn, how the family also experiences negative consequences. Most of all, this book is written to shine light into the confusion of addiction, and to inject hope by offering a redemptive point of view. It will guide the family both through active addiction and then into the hope of the recovery process. Trying to find your Third Edition workbook and it seems to be out of print. Amazon only has used book for exorbitant prices. Can you give me any details. I’d be looking for 5 copies. Hi there! I ordered 2 of the Christian Codependence Recovery workbooks from Amazon a couple of weeks ago and have not heard anything back on shipping. Are they on back order? And is Amazon the only place I can get copies? I was thinking about ordering a third copy as well. Hi Michelle! I’m so sorry! There was some problems only because we had the book temporarily offline to make some publishing changes. And for whatever reason it took forever to get it back up. We don’t have anything to do with the sales. ordering or shipping on Amazon, so you’ll have to talk to them directly and find out what happened. What I can do is pop you over a PDF of the workbook? Would that help get you started while you wait? Be sure to talk to Amazon to find out about the order! Thank you for your response Stephanie! I just contacted the seller on Amazon which was actually LoryWarehouse… Amazon had contacted me to say that I needed to contact the original seller which I mistakenly thought was your organization since that is where I originally started. Hopefully, they will let me know what is going on quickly! A pdf would help us to get started quicker if you don’t mind though! We have listened to your talks already (a little backwards, I know!) and are looking forward to seeing how the Holy Spirit works through your workbooks! My email address should be in the information below. Thank you so much for your ministry! Never in a million years I felt that I was a codependent person, I makes a lot of sense now. I will love to get a workshop book but honestly I just can’t afford it right now. Does The Christian Codependence Recovery – From Surviving to Significance go along with the video series you present on YouTube or is there another video series it coincides with? Hi Gregory! Yes! They sure do! Look for the “Intro to Codependence” class. We have another book called A House that Grace Built that has some videos – I am getting ready to teach a live session for that in a few weeks. That is part 2 or sometimes called Advanced Codependence. Blessings on your journey! Hi Isabel! The book available on Amazon is the latest update – I’m not sure why the icon looks like the older version – I just noticed that recently, but rest assured, if you are ordering from Amazon, not a third party, it’s the third edition with the group leader manual. Hope that helps!